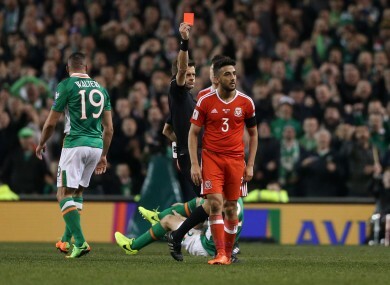 Neil Taylor is shown a red card. SHANE LONG COULD clearly see the excruciating pain his team-mate was in. The tackle from Wales wing-back Neil Taylor was a dangerous one, and the graphic images of Ireland captain Seamus Coleman’s leg snapping going around leave no doubt that he has suffered at least one fracture. Lying on the ground helpless, Long came to his friend’s aid — kneeling down to cradle his head as he received treatment. “It’s not nice,” the Tipperary man said after the game. “I was trying to comfort him on the pitch. He’s loved by everyone, he’s a big player and he will be a big loss. Taylor, who received his marching orders from Italian referee Nicola Rizzoli, went into the Ireland dressing room to apologise to Martin O’Neill and his players after the game. He has been roundly-criticised for the challenge but Long doesn’t believe he intended to hurt his opponent. “I think he has got it done to him before so I suppose he went in worried about the challenge,” Long said of the Aston Villa full-back, who broke and dislocated his ankle while at Swansea in 2012. “He caught him high and I think he was in tears afterwards. He knows the pain Seamus was in because, as I said, he’s been there before. With an extra man for the final 20 minutes, Ireland failed to capitalise by finding a winning goal and the Group D rivals played out a scoreless draw. Ireland remain four points better off than tonight’s opponents after the result, but it does feel like a missed opportunity given the circumstances. “It was disappointing when they went down to 10 men that we didn’t kick on and get the three points, but a point isn’t a bad result,” Long added. “We’re still sat nicely in the group and it’s all to play for. Email “'I think Taylor was in tears afterwards. He knows the pain Seamus was in because he's been there before' ”. Feedback on “'I think Taylor was in tears afterwards. He knows the pain Seamus was in because he's been there before' ”.